When I posted my Vase details a few weeks ago, a few of you commented on the polka dot fabric I had selected - it's gorgeous isn't it? 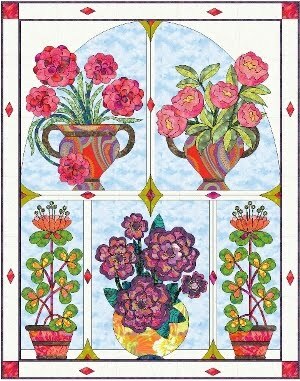 But that's not the only reason I selected it for the LE vase. 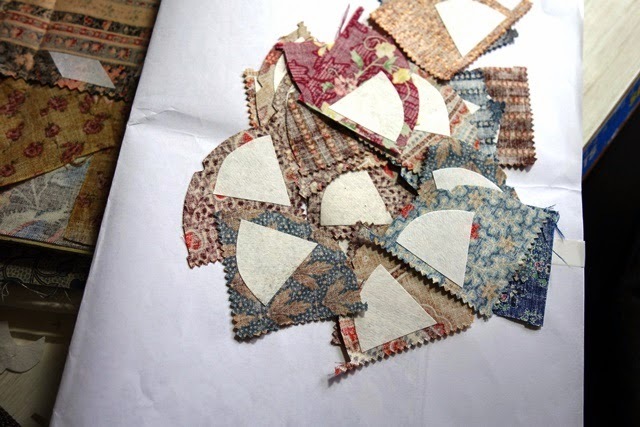 The reason I choose it is because of the story behind it: like LE, it's full of romance and mystery - its a scrap from an old antique wedding dress. I've had this scrap for over 20 years, I could never throw it away or use it on just anything - I knew that one day it would find its home somewhere special, and now it has. When I took possession of it, it was already old and it's actually older than I am. 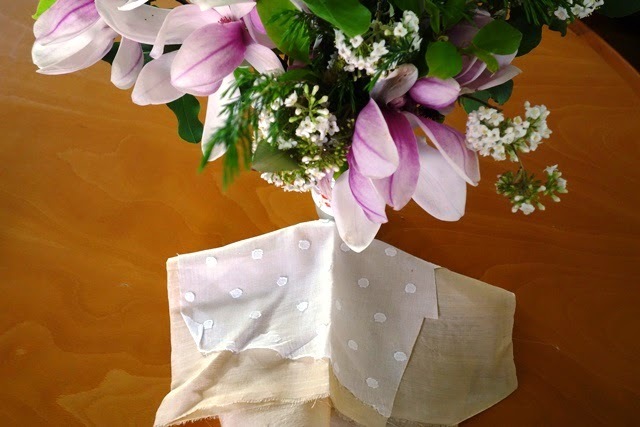 I love the whimsy and romance of it...and then there's the polka dot element of it - who can resist a polka dot? Not me, that's for sure. 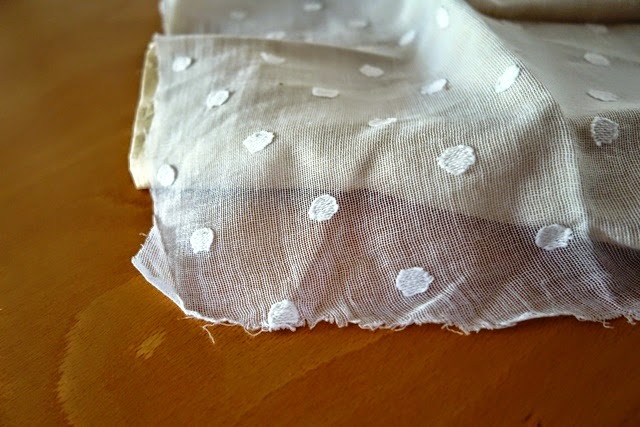 I backed this fabric with a beautiful beige silk and stuck it down with basting spray. 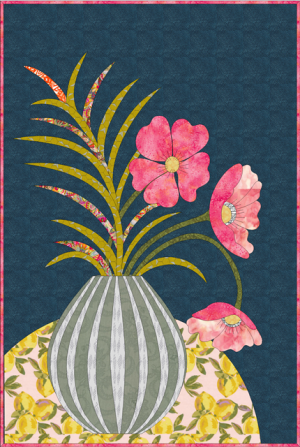 When it was in position as the vase, I hand sewed it down to keep it anchored. 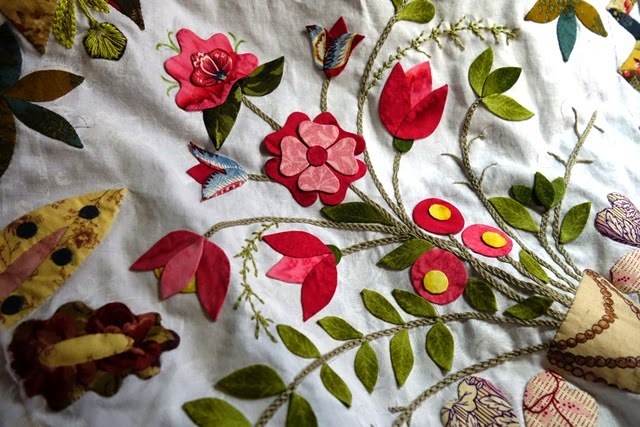 I love it when fabric has a story to tell. 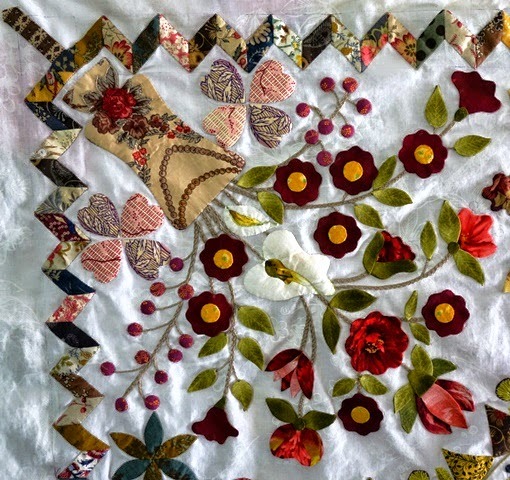 It makes no difference to me whether I know that story or not - material from an old wedding dress is very special material indeed and is perfect for Love Entwined; it just adds another layer of mystery to what is a love inspired evocative quilt. Are YOU Coming to AQC 2015 ?! Secure your place by clicking YES I would like to book a class OR click on the button at right OR on the AQC website. The link will be active from 10am (AEDT), Tuesday October 28. Remember there are limited spaces for each class, and they can fill quickly so we encourage you to book early to avoid disappointment. This year we have an all new booking system for the classes which is easy to follow. Make sure you have your AQC class timetable beside you. 1. You will NOT need a password to book online. 2. Visa and Mastercard ONLY will be accepted as payment for online bookings. Confirmations in class are subject to available funds on your credit card. If your card payment is not able to be processed, your place in the class may not be held. � The primary registrant for this application (YOU) will receive all email confirmations for all bookings in the order. 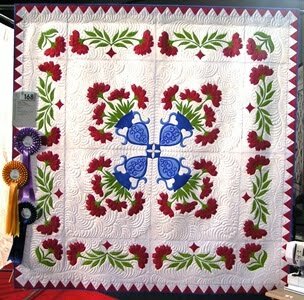 The double bow border is actually the first thing I noticed about the original quilt in 'patchwork' so this border is very important to me. 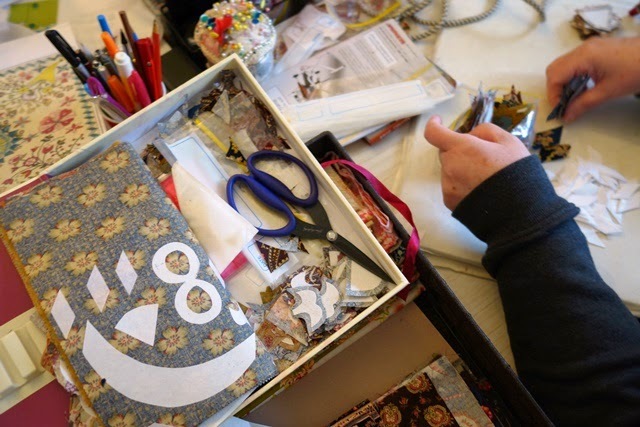 I've created a 'double bows' box, just like I did with the 'zig zags' and this is a box that has everything I need for just this section of the quilt. I know I've said it over and over, but this quilt is a practice in preparation, so here I am preparing. 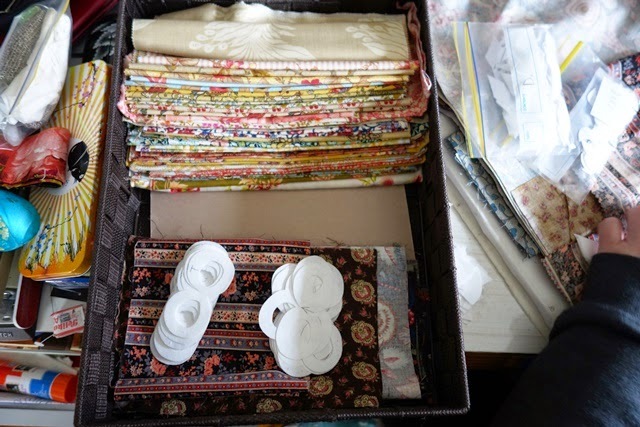 My favourite part of the quilt is when I reach those stages when I can just grab my 'section box' and pull out the prepared pieces, position and play around with them. But to reach that happy moment, there's work to do first. A lot of work. You can't make it as you go, or you'll fall into chaos. Step by step and prep by prep. 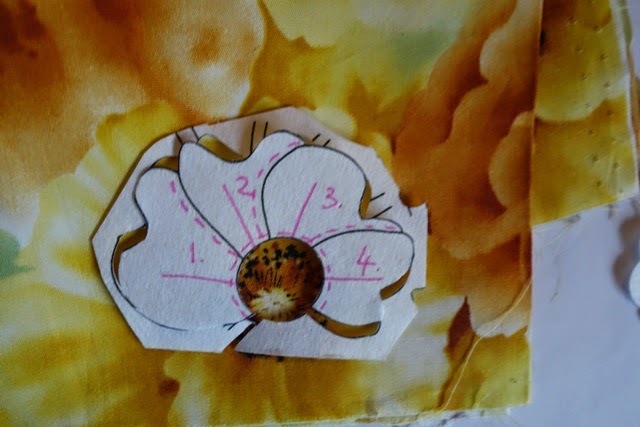 It's the only way to keep your order when working on a once in a lifetime quilt like this. 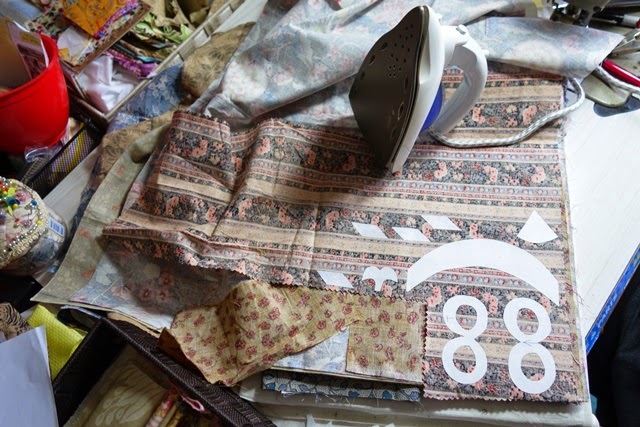 I mark my patterns with arrows to show me which way is 'up' when I position just in case I want to fussy cut. 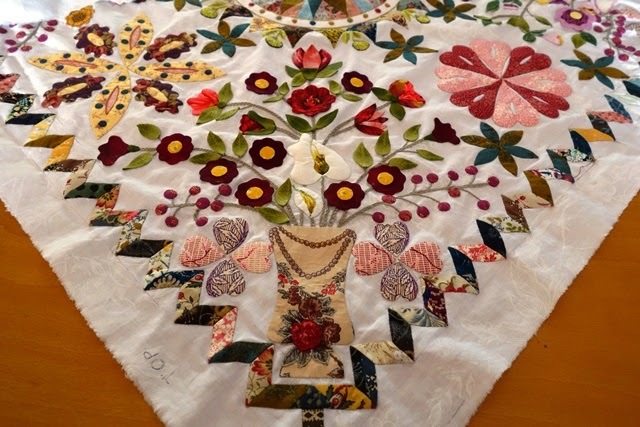 I have a few dewbies or 'triangles' from Part 8 floating around too (above) as I will incorporate the swag and bow fabrics elsewhere in the quilt in tiny areas throughout to keep the whole scrappy looking harmonised. 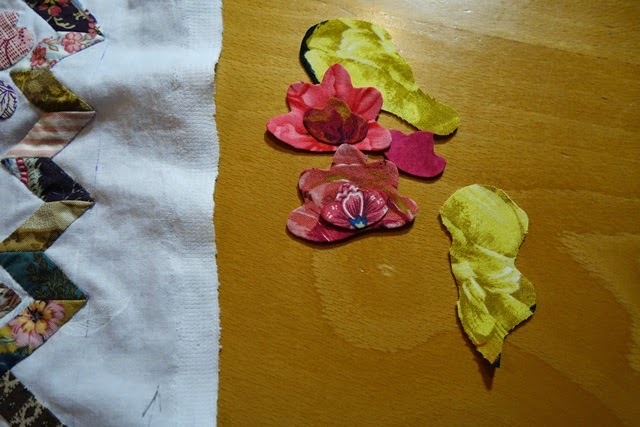 And I've even started fussy cutting. I learnt early on that you have to do the parts which appeal to you whilst they appeal to you. I can't schedule my available time ' to fussy cut for the bow border'. 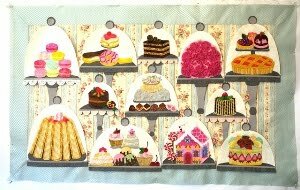 I wish I could be so disciplined, but I find that if I'm not in the mood, I won't do it or if I try it will look all wrong and that ends up being a waste of my precious sewing time. So I work on whatever takes my fancy that day. This is why I'm working at numerous sections 'at once' and why I'm working back and forth between all the parts that make the pattern. I have my own methods and this is what works for me. I think that if I did it any differently, I might never finish. 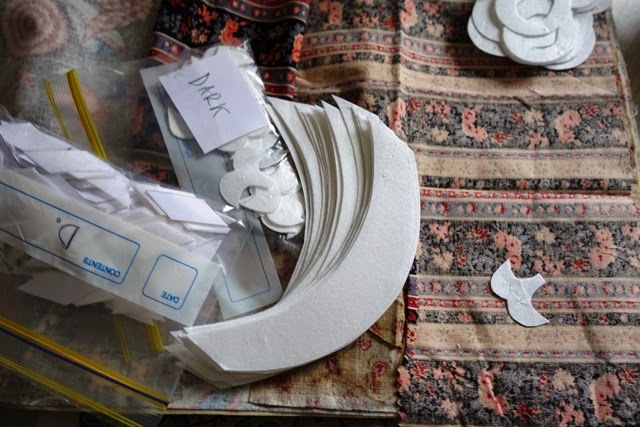 How do you organize your preparation time? 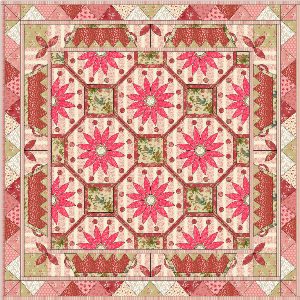 Many thanks to Amy for so generously hosting the Bloggers Quilt Festival once again and a warm welcome to any linky hoppers who might be here for the first time. Welcome to my blog! Please consider leaving me a comment and come back again soon. 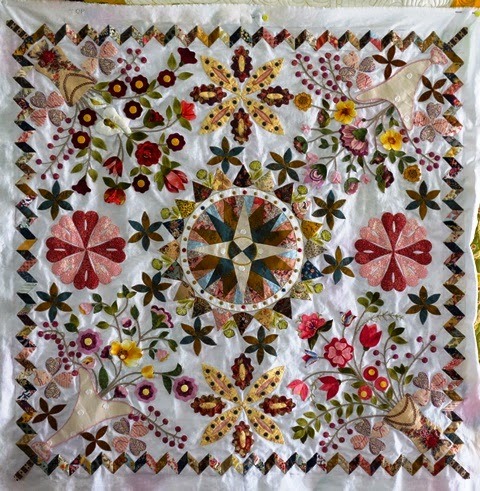 This is the first vase from the centre of my applique quilt, 'Love Entwined: 1790 Marriage Coverlet'. 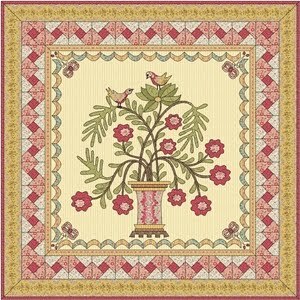 It is an heirloom applique design and is a homage in remembrance to the original coverlet of no name, known simply as a 'fine marriage coverlet dated 1790' in Averil Colby's publication 'Patchwork' of 1958. 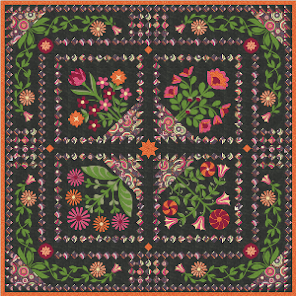 This is a heritage quilt; completely and intensely devoted to applique. 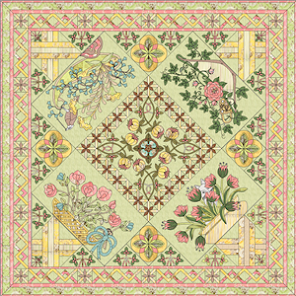 There's a lot of mystery and intrigue concerning the original coverlet - the unknown maker used motifs and elements not seen in her era and this has raised a lot of mysterious and intriguing questions regarding her place in society, the origins of the quilt design and her intention (and application) in making it. 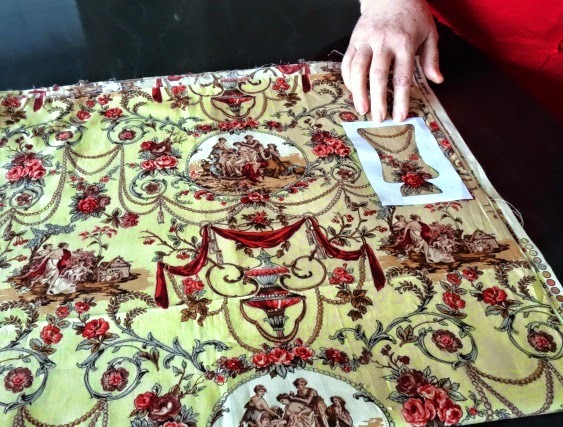 From the moment I saw this quilt, I recognized it as an extraordinary Georgian masterpiece and knew that it had to be revived and remembered for it's unique place in history. In 2013 it was all but forgotten. But not for long. 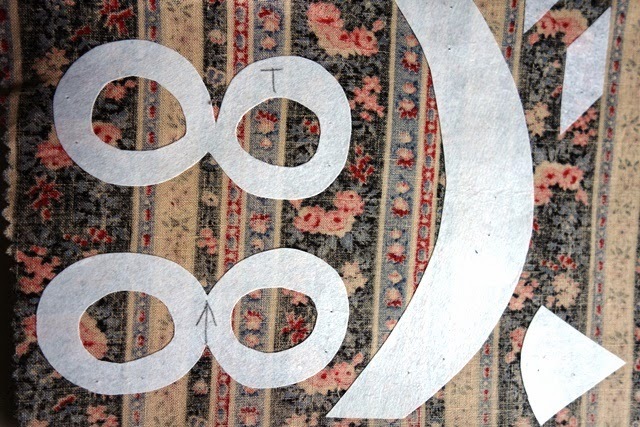 I set about creating a pattern in remembrance to it and the unknown woman who made it. 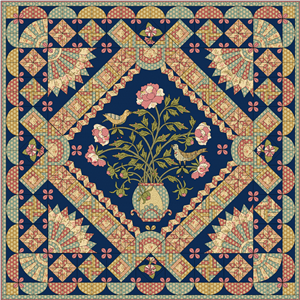 Once I had the pattern created, I wanted to ensure that this quilt and its motifs would be revived and recognized today - so I released it for free as a BOM over a period of 18 months. This month, October 2014, marked the final installment. Did you miss it? Don't worry, all the parts are now available for free download. 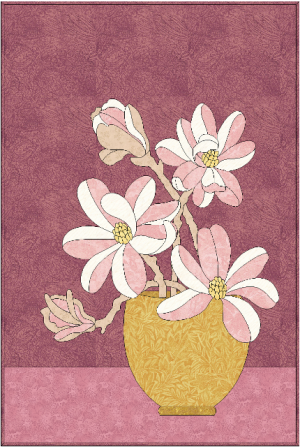 Yes, this quilt pattern is available to anyone who is interested in making it, for free. Why? 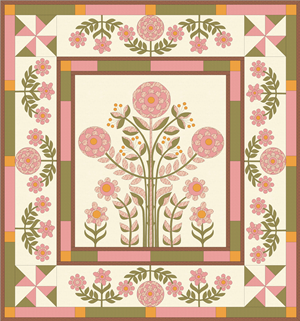 Because I want to see this quilt and elements of its design revived and remembered. 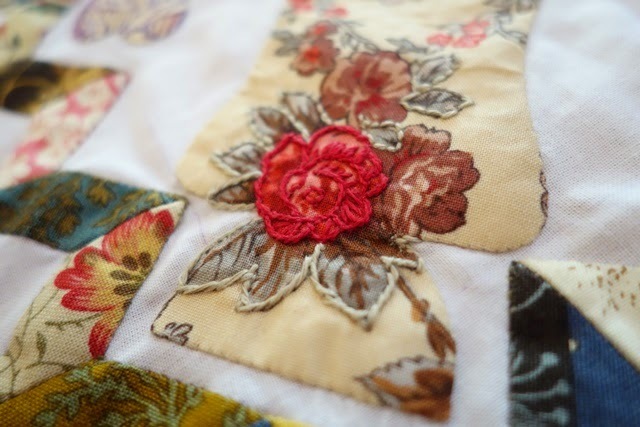 This quilt is so intense and fussy that I couldn't possibly show you all my favorite details in one post. Of course I'm biased, but I think every detail is wonderful! So I'll just focus on a few details of the first vase. 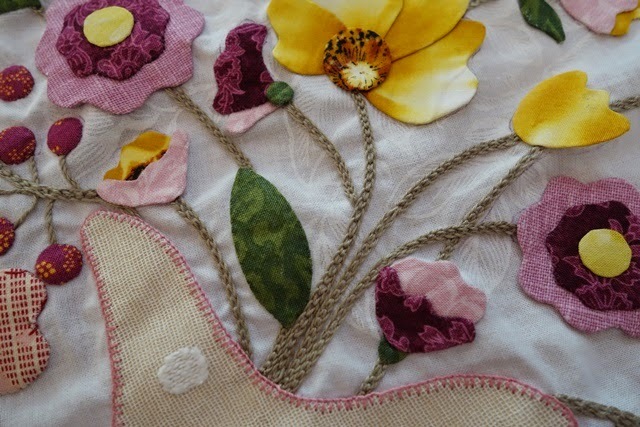 What I really love about this quilt, is that it is so intricate and busy. That's not usually my style. 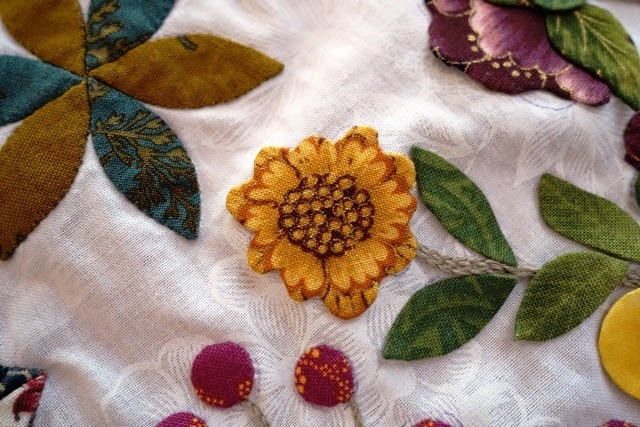 But I have found that as I spend hours working on certain motifs and pattern details, my mind starts to wander and wonder about the original maker. What was she thinking? How creative she must have been! 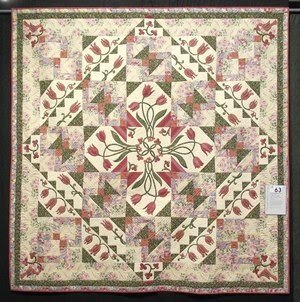 Surely this quilt would have been the talk of society in her circle! 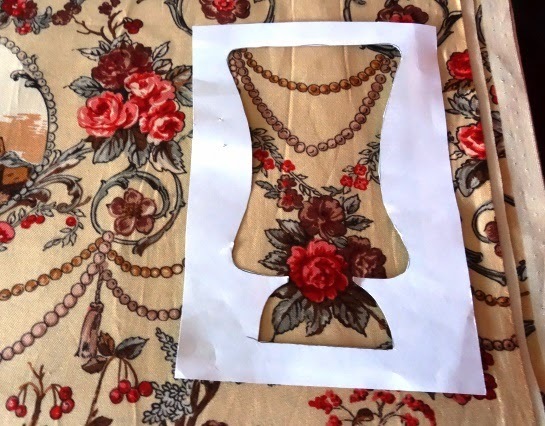 For its true, we know so little, but what we do know (or can at least be confident) that she must have been of a certain class and society in Georgian England to have access to this hobby, its design process or purchase, its mathematical elements and the fabrics used. It's such an intrigue! 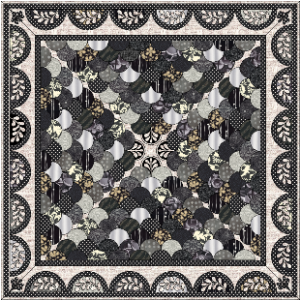 And once you start devoting hours to this quilt, well, you just can't stop. 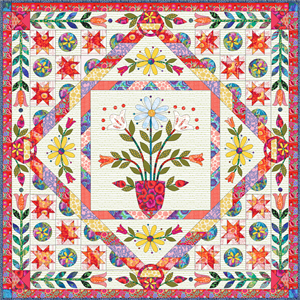 This quilt really has a personality all its own. And every block is so intricate, you can really dress it up with all your skills and interests. 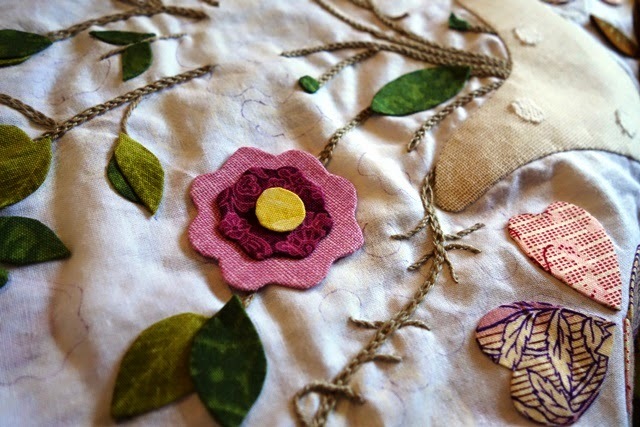 There's plenty of room for fussy cutting, embroidery, embellishment and broderie perse. I'm sure a few charms here and there wouldn't go amiss either. 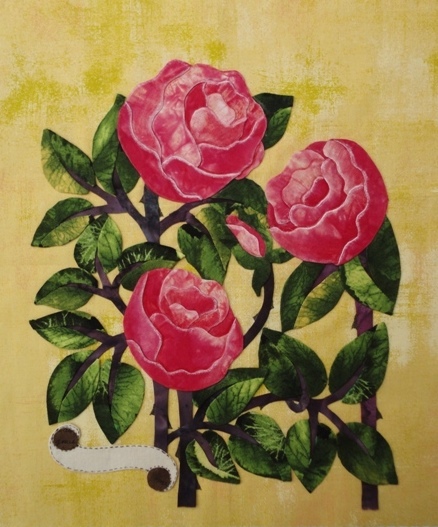 and as you can see, it transformed my work from beautiful to heirloom. 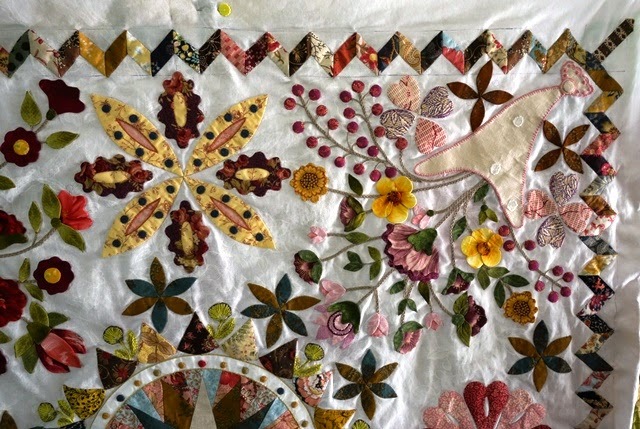 But what I really love is that when I make this quilt, I am a part of history, taking part in it and contributing to it. I wonder what our unknown maker, in 1790 would think if she could see me now... I can't even imagine! 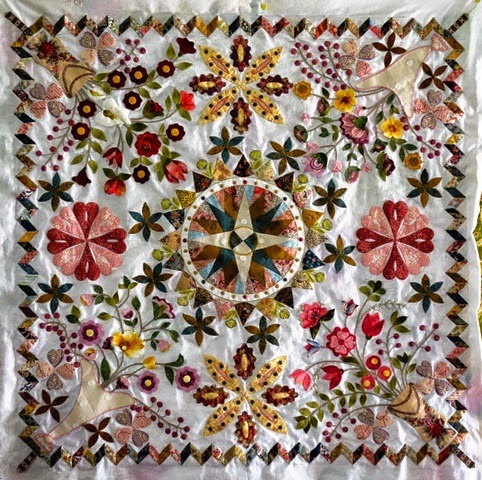 What I do know is that this quilt really shines when you pay attention to it, the more the better, And I can see it being worked for hours, weeks, months and probably years - one hour at a time in the drawing rooms of fine estates in Georgian England. I really wonder how many fine homes the original 'visited' as it was being made. 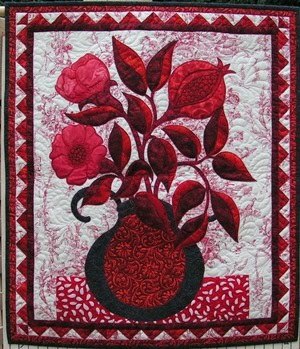 You can probably tell, this quilt is dear to my heart and I love sharing it with others. 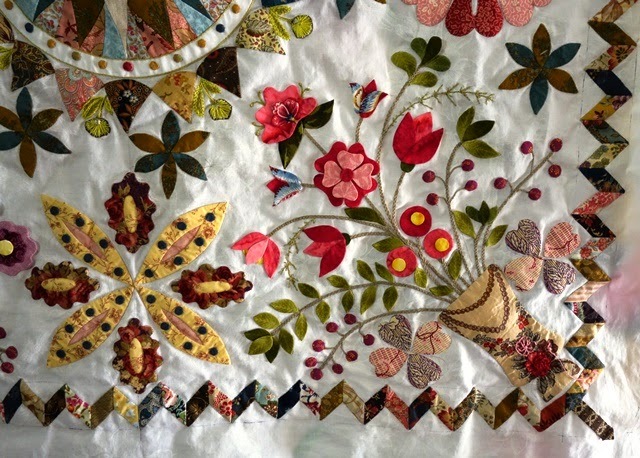 Love Entwined:1790 Marriage Coverlet is a work of art, a piece of history and an epic applique masterpiece! 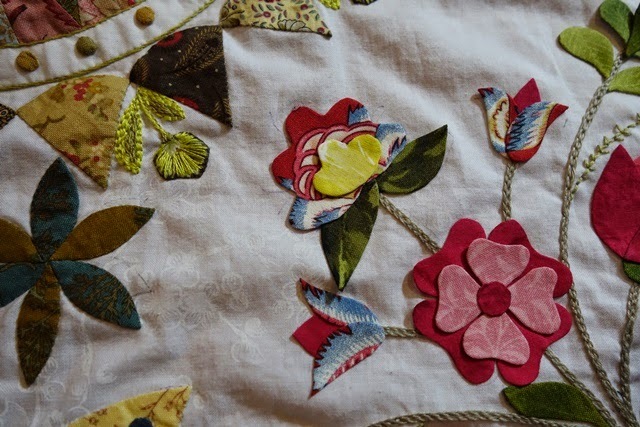 I am hand sewing the whole quilt and using turn edge applique as my method alongside wash away fusible. 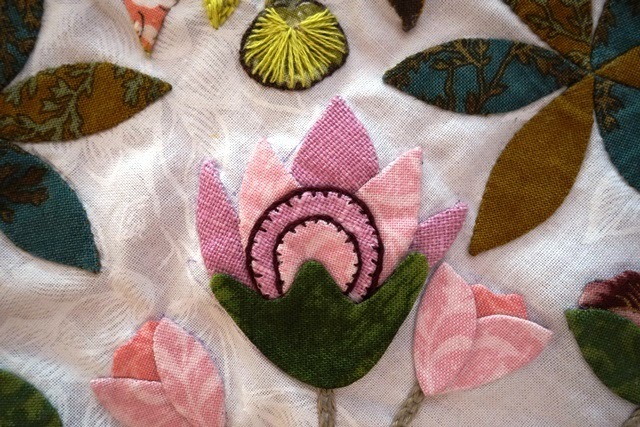 Of course, it lends itself to raw edge applique too and from Averil Colby's description, there certainly is raw edge on the original. 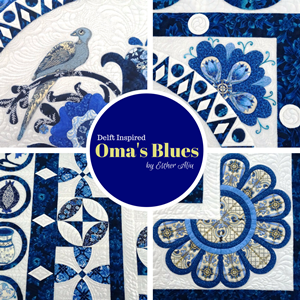 Thank you for visiting my blog today and for viewing my post on this very special quilt. I had no idea what I started when I released Love Entwined. It's been an epic journey for me and I'm really pleased to finally have the centre completed.Yes, there's a lot of work ahead, but for the first time, I can see the end in sight. 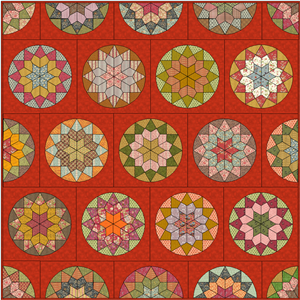 With the centre done, I feel suddenly much more relaxed about this quilt. I am completely content now to just move ahead with my own version of LE and maybe even start thinking about releasing my next BOM. Yes, my Love Entwined center is done. This image is a bit dark and moody, the lighting conditions aren't great at the moment but I couldn't resist taking a picture anyway. Although the colours aren't showing up as true, I still think its incredibly beautiful. So, now I have two weeks hand sewing (if I sew 8 hours a day, 5 days a week) or 4 - 6 weeks at a few hours a day in the evenings. 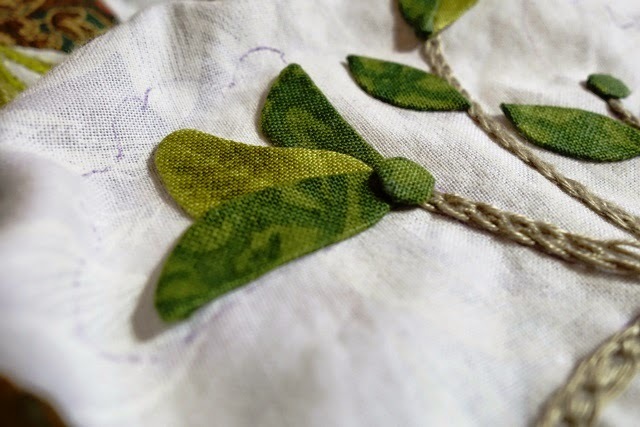 I think what this means for me is that I will start moving ahead with the borders and prep work for the blocks ahead and keep the hand sewing task as my 'break' work. Love Entwined, I can't believe I'm finally here. 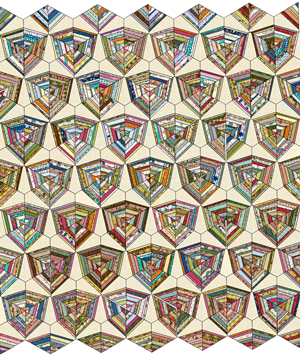 It feels like just the other day that I was thinking of drawing you up as a pattern! This is my most intense and time consuming quilt, ever. What can I say? 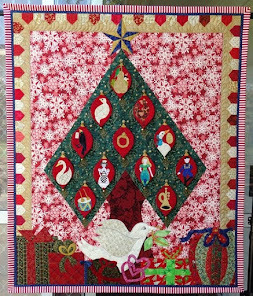 I love the adventure and mystery of this quilt. Meeting the 1st Love Entwined! 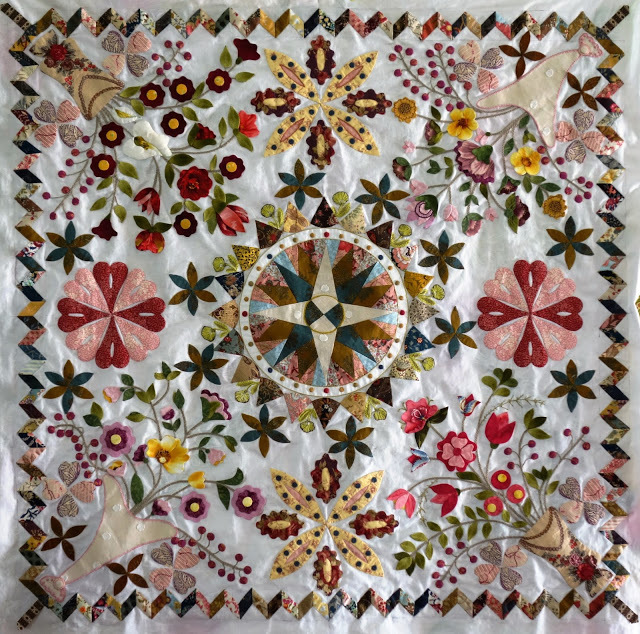 Last week I blogged about Narelle Birchall and her LE - she is an extraordinarily talented quilter and the first person, as far as any of us know, to have finished Love Entwined. Am I serious?! Yes I am! Just thinking about it leaves me a little breathless. But Narelle isn't just talented, she's also generous and giving too. 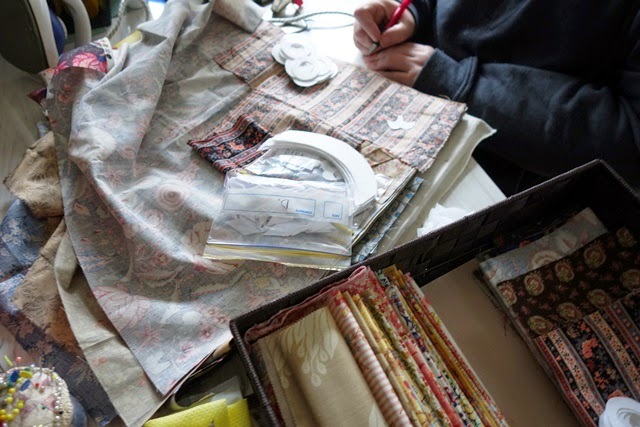 Last week we met up at Quilts in the Barn over in Wonga Park and I was able to see her work firsthand. This has been the first moment I've had to blog about the whole experience. So it was taken outside and pegged to the tennis court fence. 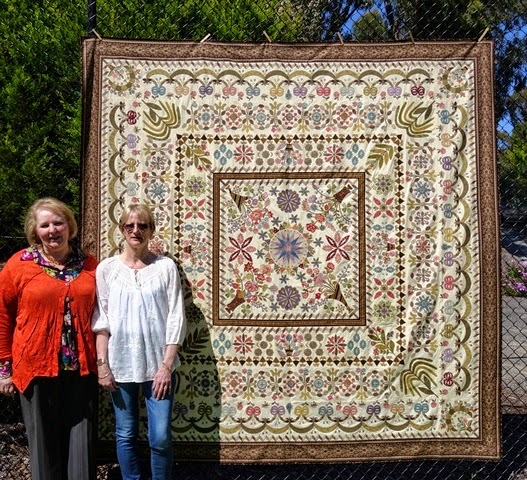 It was an incredibly bright day and the glare was overwhelming for me, all my photos turned out blank or washed out and I got one of those instant sun headaches, so I was very grateful to Linda who knew my camera better that I do and put it on the right setting so that I could capture a photo with Narelle in front of her majestic quilt. We are both somewhat stunned by the light in this image, but I think you can see how spectacular Narelle's Love Entwined is. Narelle, you are talented beyond words. I can tell you that it truly is spectacular and that Narelle has accomplished years worth of work at a rapid pace. And yet, it's incredible in every way. 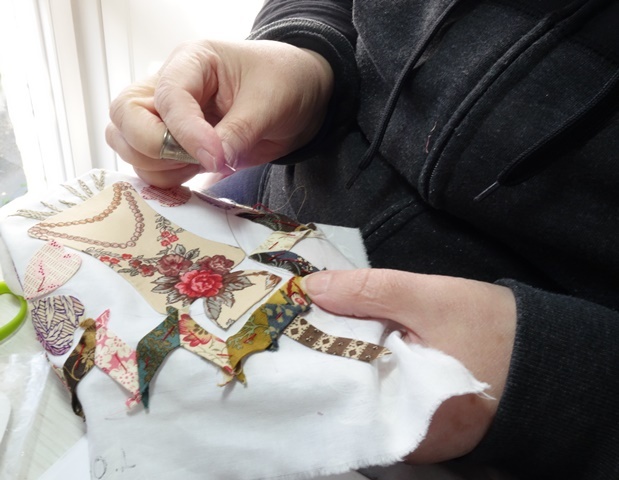 Her fabrics, her workmanship, everything just left me speechless. I'm already at that stage with Love Entwined, where I just don't know what to say about it anymore. It has been an epic and heartfelt journey for me and I feel in many ways that I have done what I felt I needed to when I started this project. With the last installment released this month, I feel somewhat 'finished' emotionally with the drive that was needed to release it. From this point onward, it belongs to whoever makes it and takes on its own character at each hand. 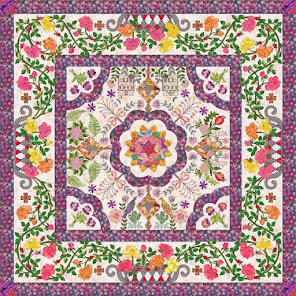 Seeing Narelle's quilt made me fully 'realise' that this quilt is out there in the world now and this leaves me deeply contented. Did I mention Narelle's excellent workmanship? She really is talented. 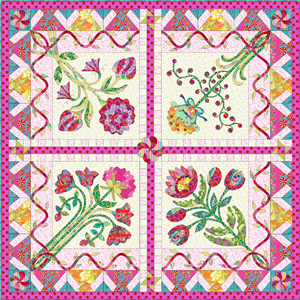 This is perhaps the most difficult block in the entire quilt and she has made it look effortless and simple. 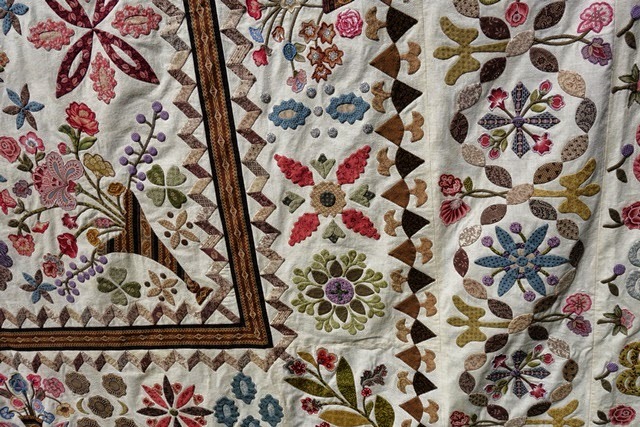 It's very difficult to photograph a quilt like LE because there is so much detail and these details are not distinguished in overall quilt front pics. So here is a close up shot. 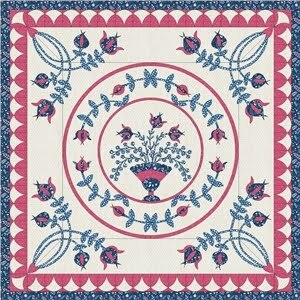 I can tell you first hand that every inch has been made extraordinarily well, this quilt is a masterpiece. My deep thanks and gratitude to Linda who allowed us to unfold LE and then peg it on the tennis courts, and for taking the images I am in when I couldn't manage my own camera (honestly, I'm hopeless with those things), and to Brenda Manges Papadakis (that's a whole other post!) 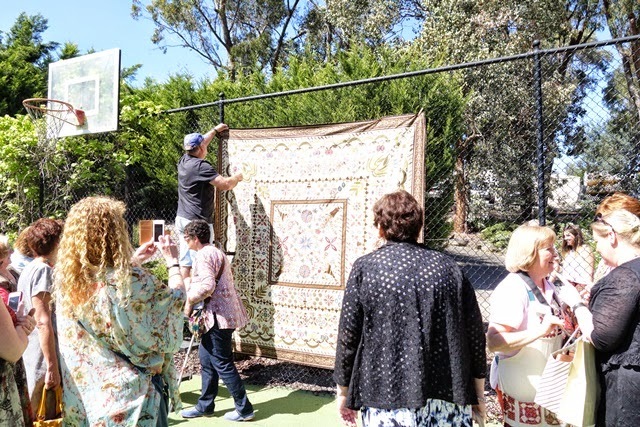 and of course to Narelle Birchall - its incredibly generous to take the time to show your quilt and to have allowed me to see it in real life. Thank you so much for thinking of me. Yes, Love Entwined is officially out there. What do you think? These last two vases just flew into being finished. 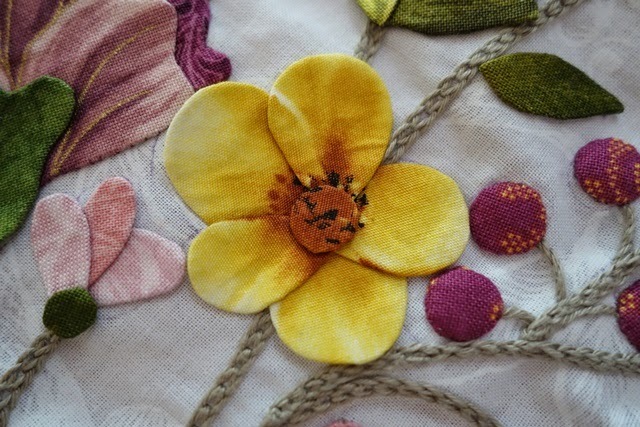 I really loved working with the sunshiny yellow too. Here I am, auditioning the fabric for the best spots to pick. 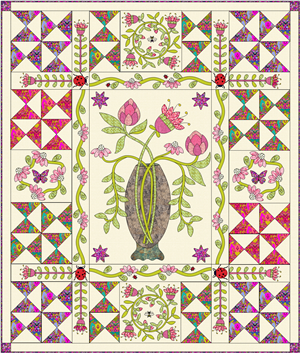 You can see that this print from my stash is actually a flower print, so the colour graduations are just lovely. and overall, I love the look and it all balances with my compass and fabrics. I've completed my four vases and I'm so pleased with how they look. My center is done now. It feels remarkable to have reached this point. 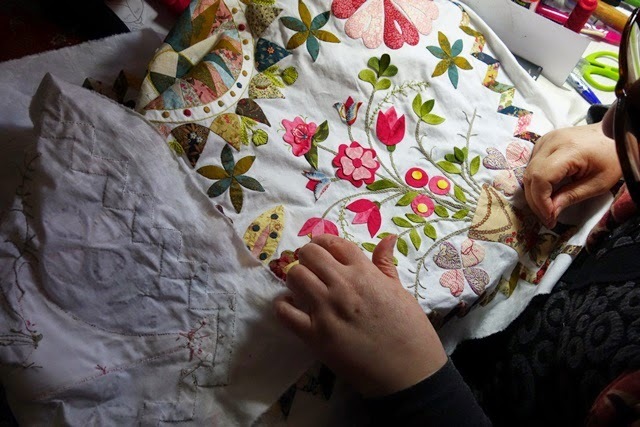 It's been exhausting at times and when I hold this center square of fabric, I can't believe how much time, work and labour has gone into creating it. 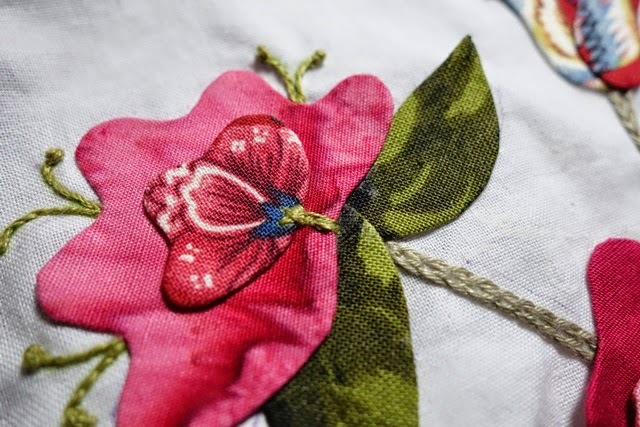 I have a bit of hand stitchery to do for embellishing and about a 2 weeks worth of hand sewing to stitch all the applique down into position. What you see here is mostly held into position with Elmer's Glue in disappearing purple. This is a starch based glue which simply washes away. 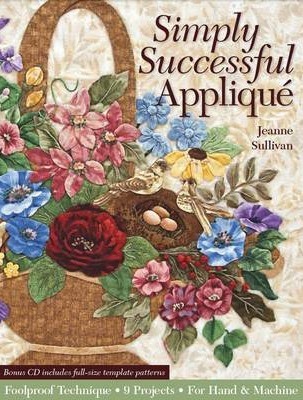 I use it all the time - actually its the only glue I use for applique when quilting. That's the calm before my storm. Which storm? My creativity storm for the borders! I can't wait! These are my opposite diagonal vases 3 & 4. They're very similar and I have chosen to make them both purple and yellow. The top vase being darker and the bottom slightly lighter. I don't usually use a lot of purple, but I think it really works between these vases. As you can see, I was auditioning the purples before I even stitched down my berries. I put these purple blooms aside very early on, deciding I wouldn't use them. 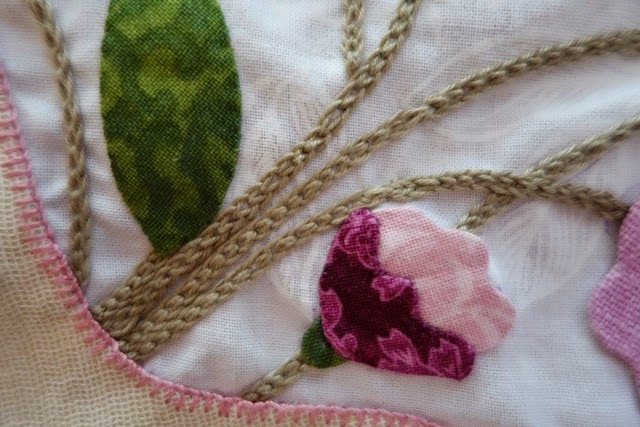 But now, with my berries stitched down, it works. 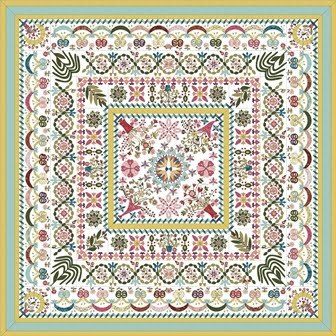 Well, I think reaching the last installment of Love Entwined 1790 Marriage Coverlet is a pretty big WOW! Don't you agree?! I knew this day was coming the moment I released the pattern, and yet, I never really thought it would come. It's such an epic quilt. It has touched me in so many ways. It has occupied my thoughts for so many hours. 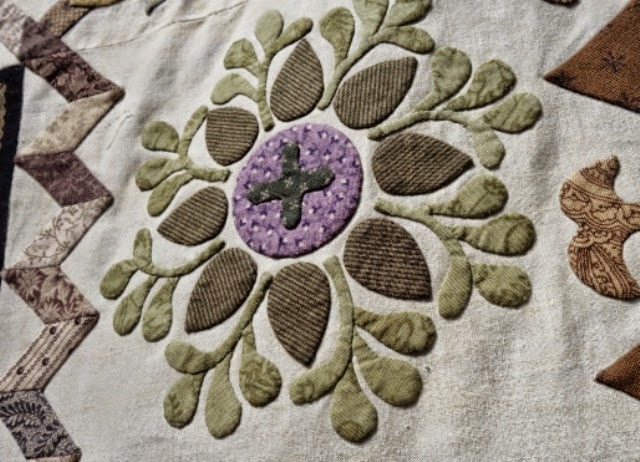 It has taken up a place in my heart as a story, as a moment, as a reminder of quilting, and quilts and quilt makers who have been before us. And I feel like I need a lie down, or a glass of champagne, or something to really mark this point. Because here it is; the last installment of Love Entwined. 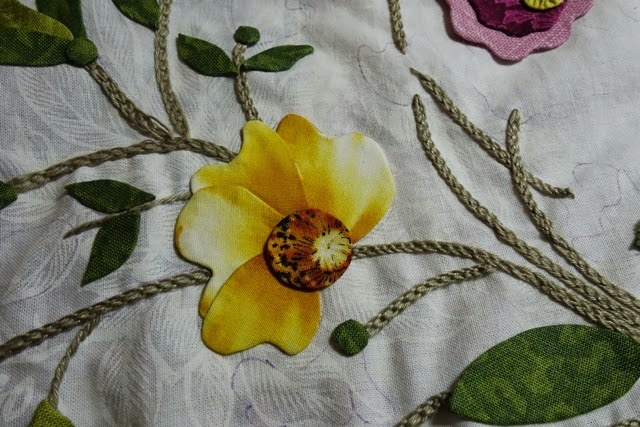 And whilst I have many hours ahead of me yet, to applique and create this masterpiece, the journey of releasing it out into the world - in order for it to be revived and remembered, has come full circle and closed. I've done what I needed to do. 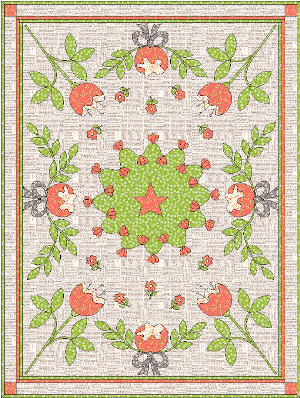 As for the pattern this month: there's only the last borders to add and any final assembly of the quilt top. 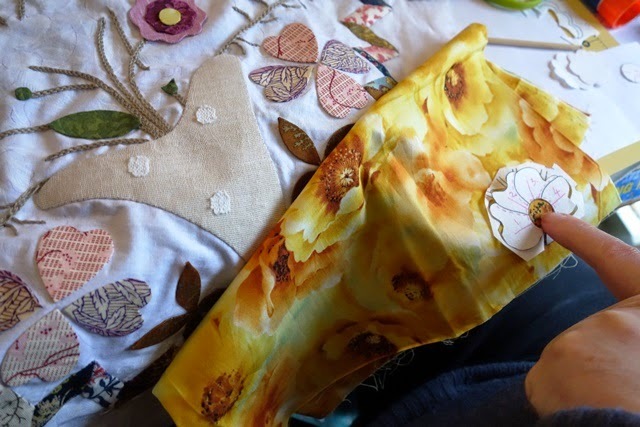 And whilst this is the last installment, don't worry - there's months of LE blog posts yet as I share my journey right until the end with you all here. What else can I say? I'm feeling so many things. Thank you for embarking on this special journey with me. 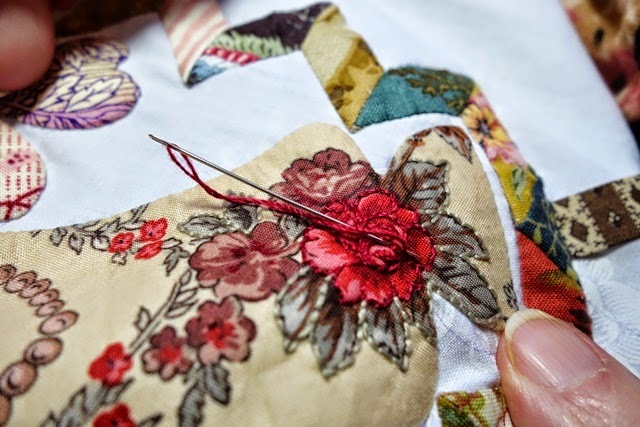 I know LE is the kind of quilt that takes time and many of you are progressing at your own pace. And it's been a privilege for me to see your work and enjoy it as much as I do my own. 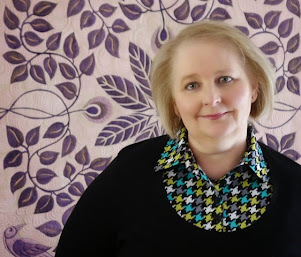 I'm delighted to be sharing the journey with so many quilters who decided to come on board and join me by sharing what they do and how they do it over in my BOM Group. 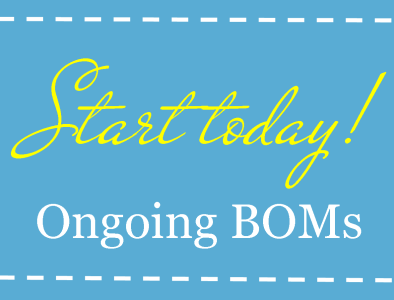 I was planning to release several BOMs this year, but I had to put those plans aside when LE was launched - it was so much so fast, I couldn't handle having more than 1 BOM out there! 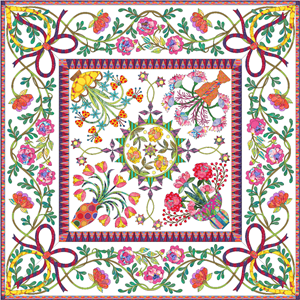 I had no idea LE would capture so many hearts when I released it and I have a heartfelt thank you to the Yahoo Group Moderators who currently volunteer and have volunteered their time and expertise to moderate our quilting group for free and for the good of everyone who wants to be there. 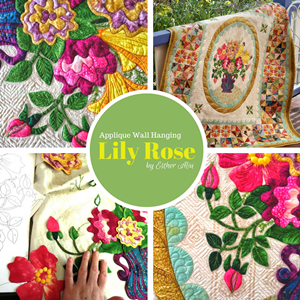 The fact is, I'm at a stage in my life where I don't have much time to be online and if the moderators didn't moderate, there would be no Yahoo BOM Group and I would keep making my quilts, but I wouldn't have a platform in which to share them with you. Thank you Anne Marieke, Glenda, Bunny, Pat and Jane, you allow me to share what I love with so many. How generous of you. Are you making LE? 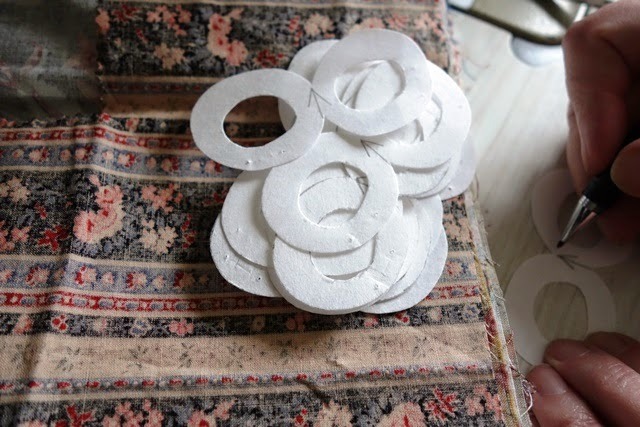 or using any LE elements in a table runner, cushion or project? 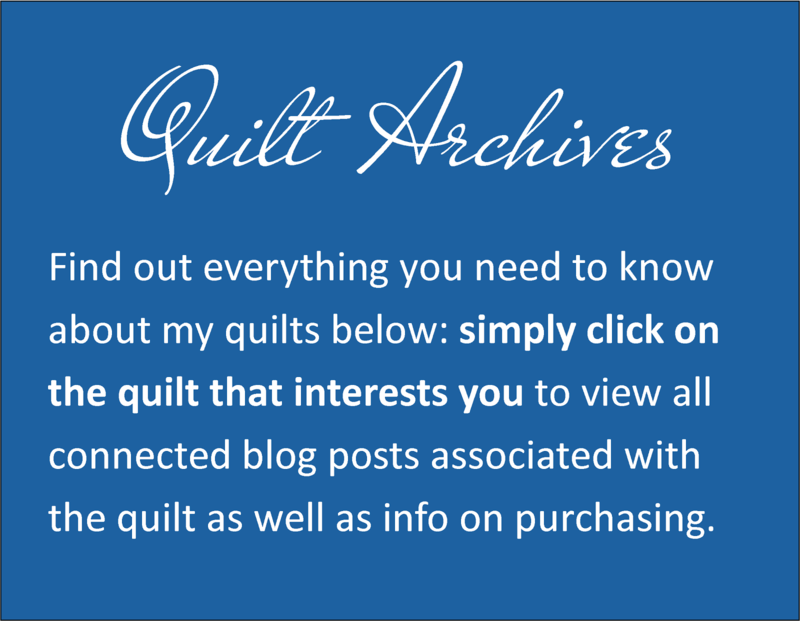 I encourage you to share your own quilting journey with all of us via your blog, in your sewing groups and in exhibition both now and in the years to come: for this is a quilt which wanted to be remembered - after all, that's where our journey started. I think we can all say, we've done our best to contribute to reviving it's legacy. 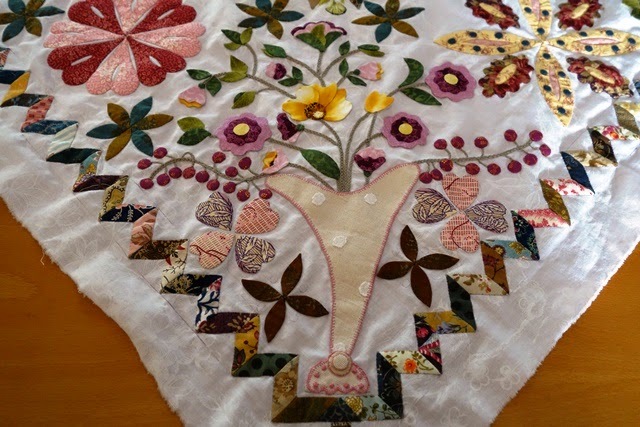 The pattern might be finished, but the Love Entwined journey is far from over: I'll be sharing how I finish and quilt this coverlet and remember- if you have any Love Entwined progress or achievement of your own to share, let us know via my Yahoo BOM Group and via the Love Entwined Page at the top of this blog. 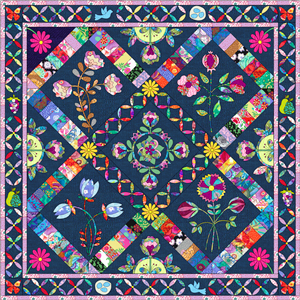 If you've made this quilt, or a part of this quilt, or a project based on this quilt, please take a moment to leave you name in the comments section of the Love Entwined Page at the top of this blog, with your name and country. 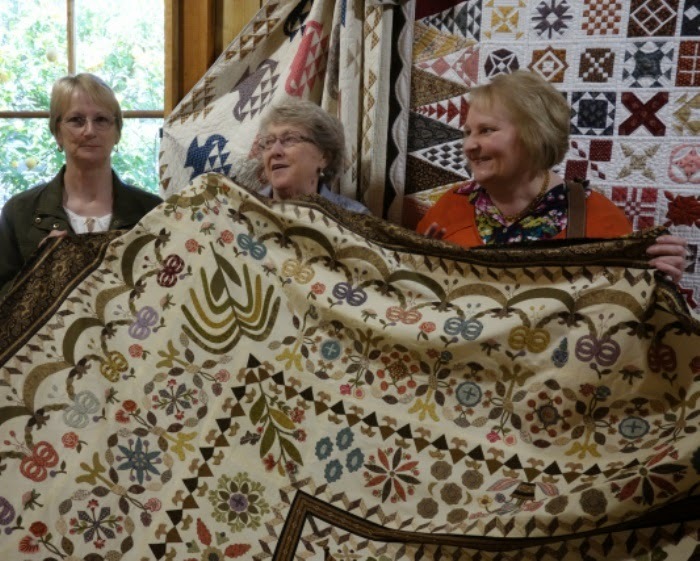 It would be nice to keep track of where these coverlets are. 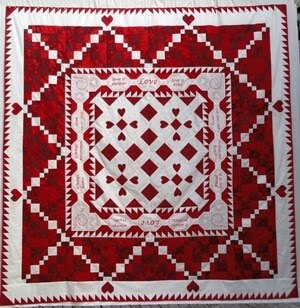 And stay in touch, I'd love to see pics of all these completed quilts! In fact, I'm currently thinking of a Love Entwined coffee table book for our members to contribute to and enjoy so that everyone who wants to can have their own legacy of this project. 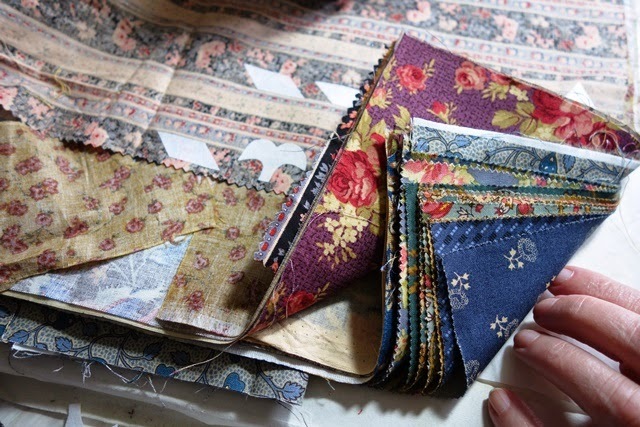 Personally, I'd love to be able to flick through the many different looks, colours and styles of LE in one beautiful book and I think this is a quilt which really calls for it. I'll blog more about that in the weeks to come, so stay tuned. 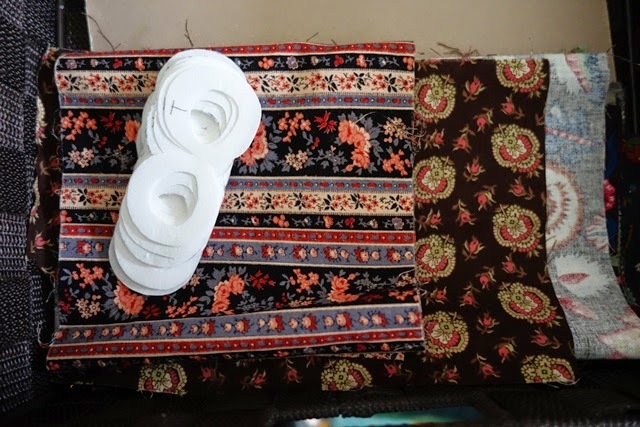 Of course, a journey like this doesn't just end: I will keep posting about my own LE journey as well as my working methods as I also come to complete my two quilts, so stay tuned. My second vase has moved along much faster than the first - I think its because I had so many cuts out ready to audition by the time I got to this stage. Here is what I finally decided on. 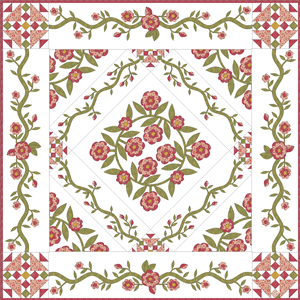 Like it's opposite diagonal, its based on pinks and reds - lighter and darker. I really thought it looked good, but luckily my DDs both ousted it - they hated it. 'Too retro' they said. Whatever that means? 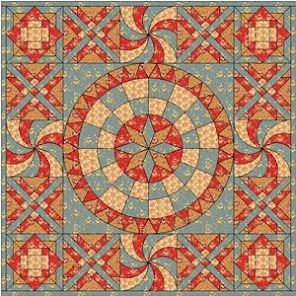 Maybe it is too colourful, but I'm sure I'll find another use for it in another quilt. 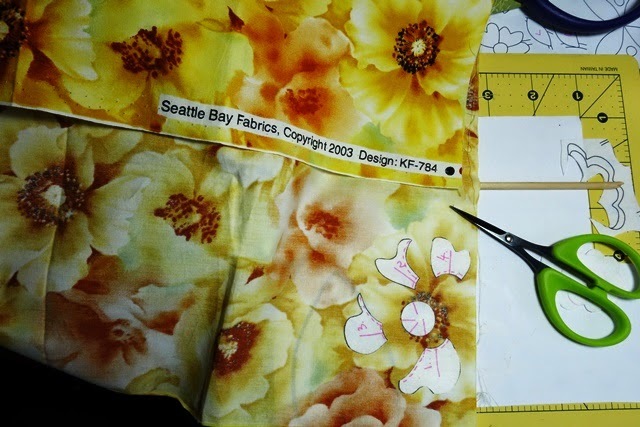 I ended up auditioning three different fabrics for this bloom (below) and none of them worked until I settled on my final one (in the first picture). As you can see, I haven't finished inner lining the hole of my cross next to this vase, so I have some extra stitchery to do before I can start on Vase 3. Yes, you read that correctly. Love Entwined 2. 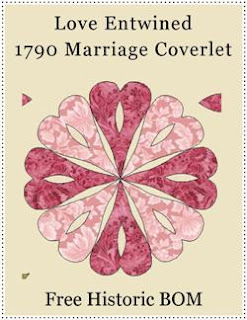 Since 'Love Entwined: 1790 Marriage Coverlet' launched, I have been inundated with requests for workshops and many quilters have asked me for a version of the original pattern that is more 'user friendly' in both size and time options. 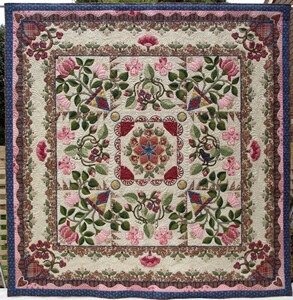 If you read this blog you'll know that 'Love Entwined: 1790 Marriage Coverlet' is a magnificent quilt and true heirloom. 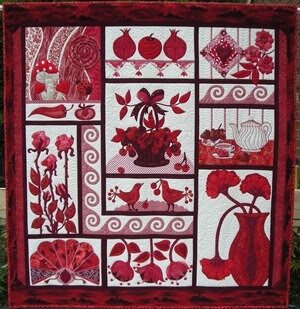 But I also know that there are many quilters out there who would love to make this quilt more practical for them. 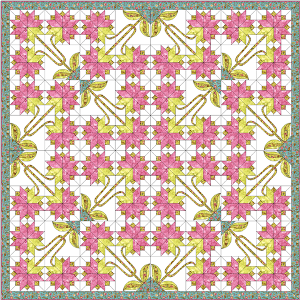 Love Entwined 2 is that quilt, using the same beautiful pattern and exploring the same beautiful techniques. 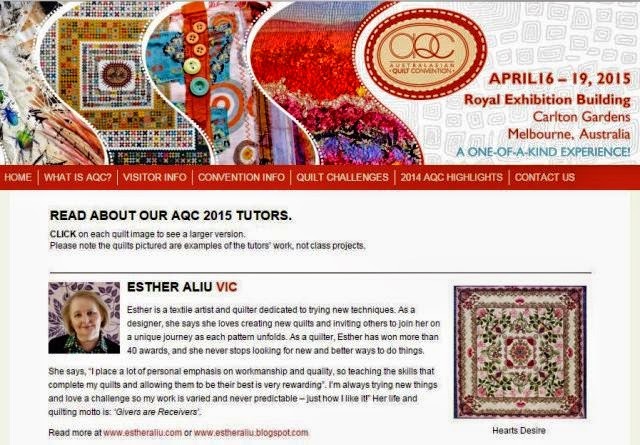 I'll talk more about both exciting workshops when further Class info is released over at the AQC website. For now I'd just like you all to know that this wonderful workshop is coming. I know many of you have asked for this - the fact is, I've just been too busy and travelling too much to fit any extra workshops in this year and next year. For this reason, I'm doubly excited to be a part of AQC 2015. Today I'm doing preparation. Again, I'm using wash away fusible and cutting out my alternating lights and darks with enough seam all the way around to neatly needle turn the edge. Love Entwined is all about preparation, preparation, preparation. And today is another one of those days.